It’s that time of year again: the long Easter break. This weekend is a perfect opportunity to spend time with family, reconnect with old friends, and create memories that will last a lifetime—similar to the experience you’ll have when you try axe throwing for the first time with those you love the most. Let’s face it—Easter weekend is usually spent with family doing traditional Easter rituals like egg hunts, brunching, attending fairs, etc. But let’s say maybe you, your family, or your friends want to escape from these activities and the overwhelming pastel colors plastered everywhere. And maybe, you’ve exhausted your options. Sitting with friends at a bar or going out to dinner is blasé, and you want to try something new and exhilarating. You want to live a little. What would you do, where would you go? That’s where axe throwing comes in. It’s an all-inclusive activity that literally anyone can enjoy, and it’s a refreshingly unique experience to try with your friends and family. Just look at the Easter bunnies in this group—unrestricted fun! When someone mentions axe throwing to you, what goes through your mind? Burly lumberjacks wearing flannel and a Canadian tuxedo, a group of badass bikers wielding Tomahawks, or hipster non-conformists trying something new before it trends… What if we told you axe throwing is for everyone? No way in the world, right?! Well, it is—even kids can play at Bad Axe Throwing. It’s no surprise to us that a lot of people want to try chucking steel at least once in their lives. It’s a truly unique experience. The adrenaline high of throwing sharp weapons at wooden targets is unquestionably addictive. We’re in the business of making sure everyone has an incredible time (no alcohol required). Axe throwing is the perfect entertainment for this weekend. It’s a naturally social activity that’s also offbeat and one-of-a-kind. We guarantee that the memories you’ll create with your family while axe throwing are the kind of moments that you share again and again at every reunion. It’s more than just chucking steel. Who can get the most bullseye’s? Who can throw the best trick shot? Which side will win the game? The excitement and nail-biting anxiety that comes with friendly competition among your friends and family will surely have you hooked. 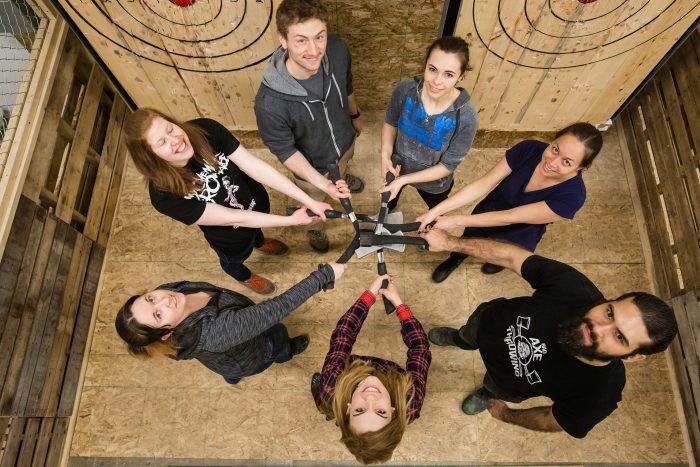 Plus, our axe throwing coaches at Bad Axe Throwing will ensure that you and your squad have the best (and completely safe) time. Now, let’s talk about one of the most important parts of any outing: food. Will we allow you to bring in those cute Easter eggs you spent hours making with family? Sure! Can you bring in a cute pastel-themed Easter bunny cake? Of course! We know it—food is essential to have a good time. People with happy stomachs are guaranteed to have a much better experience, especially since axe throwing can be a bit of a workout. That’s why we encourage our guests to bring their own food or get their event catered. Our team is more than happy to help you find options for catering and provide fluid communication to ensure that your event runs as smooth as possible. 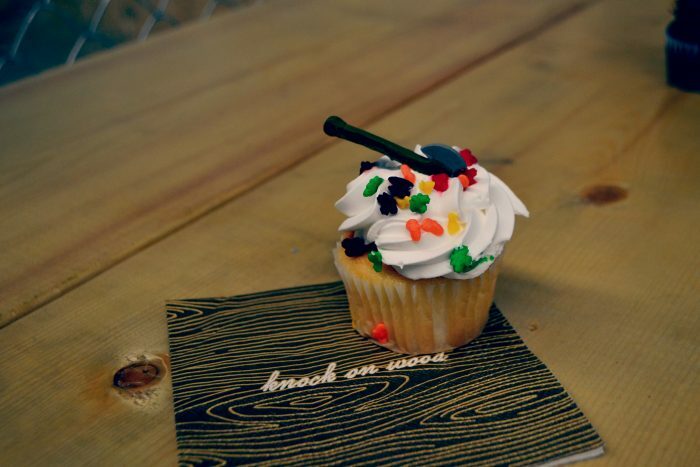 Our locations are equipped with tables, seating, mini-fridges, and a guaranteed great time. In short, we got you covered. On weekends, we typically have walk-ins scheduled for those who simply want to drop by with a smaller group or want to give axe throwing a try on their own. But we guarantee that even walk-ins are customized to suit your own capabilities, limits, and experience. We know, we’re awesome. And we can definitely back up our claim of being awesome. It’s a fact. 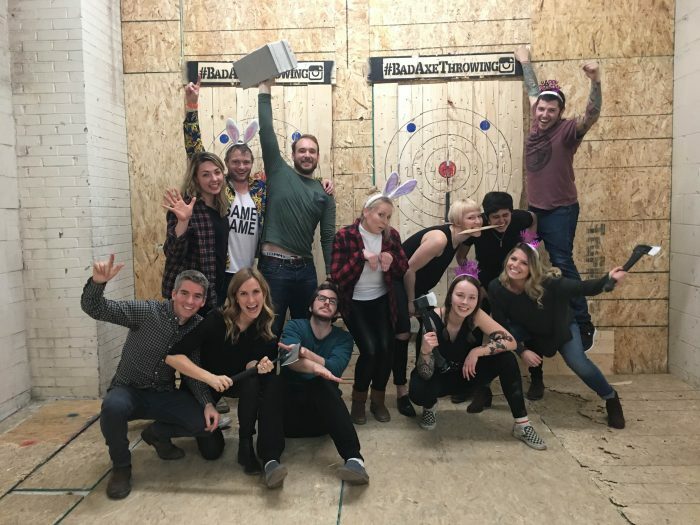 Trip Advisor ranked Bad Axe Throwing as #1 in Fun & Games in Toronto. #Winners. So, are you wanting to get away from the cutesy Easter traditions and live on the edge? Want to feel like a bonafide badass with your friends and family, even just for a little bit? Join us at Bad Axe Throwing and we’ll open your mind to a whole new world of thrills. Have we convinced you to spend your long weekend with us, yet? We guarantee not only an amazing experience but memories that will last a lifetime. Book with us today—spots fill quickly!